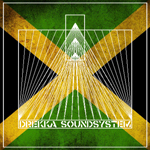 Experimental ethereal folk pioneer Drekka gives birth to Drekka Soundsystem. Dub music experiments designed to test room acoustics, amplifiers, & effect pedals. Drekka Soundsystem is incredibly creepy. Here the short length helps out considerably. Without any further context the music gains a different perspective. If these tracks went on any longer some of the mystery behind them might evaporate too. For on ‘Spartan Dub’ Drekka Soundsystem enjoys playing with the listener’s expectations. Normally dub is a soothing relaxing form. Turning this on its head creates relatively jarring little pieces that lodge themselves into the brain. Given the short period of time they manage to create something totally bizarre. ‘King Jah Dub’ introduces it with a rather big sound. One of the few tracks that exceed the one minute mark it covers quite a bit of ground. The haziness of it comes in towards the end and draws the listener into a series of fractured radio clips. From here Drekka Soundsystem offers tiny bits of songs filtered through what seems like broken transistors. ‘Mighty Dub’ rumbles forth with an almost noise-like approach. Meanwhile ‘Ital Dub’ takes on a whole new meaning churning along trying to get itself started up and failing. The failure is fascinating. By the end Drekka Soundsystem completely gives up letting the failure descend into outright radio static and noise. Finally everything that had been hinted at before is made completely true. Ah yes ‘Spartan Dub’ is a strange beast of an EP. Cryptically short and offering a new perspective on the collapse of dub (which occurred after things moved away from analog) it shows the beauty of songs literally losing their minds and their way. US artist DREKKA SOUNDSYSTEM, normally just using the moniker Drekka, has been active since the mid 1990′s with a self-described specialty creating experimental cinematic ambient industrial noise soundscapes. Spartan Dub is an EP from 2012, released by US label Silber Records as a part of an experimental series of EPs made under the condition 5 songs in 5 minutes. The press review describes this production as follows: “Drekka Soundsystem’s Spartan Dub is a collection of “micro-dubs” recorded at sound checks throughout Europe on Drekka’s Europe Endless tour in the winter of 2011/2012″. The end result, at least as far as my ears and mind go, is that we’re treated to a constellation of tracks that comes across as someone tuning a good, old fashioned radio, with fragments of a bass and piano driven reggae song appearing in a more or less fragmented manner. You know there’s more behind it than merely that when listening to these five minutes of produced sounds, but the impression sticks. Especially as the elongated conclusion comes to it’s static conclusion. A production for those with a special interest in creations blending noise and music more than music that can be recommended to people with an interest in a certain style of music. This item is all about approach and not so much about genre as far as I’m concerned. Fairly intriguing too, in a strange kind of way.